Samford University hosted the official grand opening of its new Art Lofts Nov. 7 as part of 2015 homecoming weekend festivities. Several hundred students, alumni, faculty and staff from the School of the Arts and from across campus attended the event. The Department of Visual Arts moved into the space earlier in the fall semester. The former maintenance facility has been repurposed as state-of-the-art teaching and studio space. The open space was constructed specifically for art students as a place for them to receive instruction and work on their various art projects. The lofts include classrooms, offices and personal space for students to work on their individual artistic endeavors. 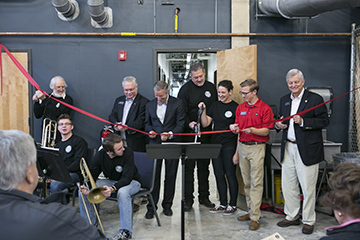 The official ribbon-cutting ceremony included a prayer from former Samford art professor Lowell Vann, remarks from Dean Joe Hopkins and Associate Dean for Visual Arts Larry Thompson, and a performance by the Samford A Cappella Choir. Jimmy Lichtenwalter is a journalism and mass communication major and a news and feature writer in the Office of Marketing and Communication.